I was at Wal-Mart this past Friday night and saw they'd mark the jelly rolls on sale for only $14.95! Our Wal-Mart is closing their fabric department and they've started to mark a few things down. 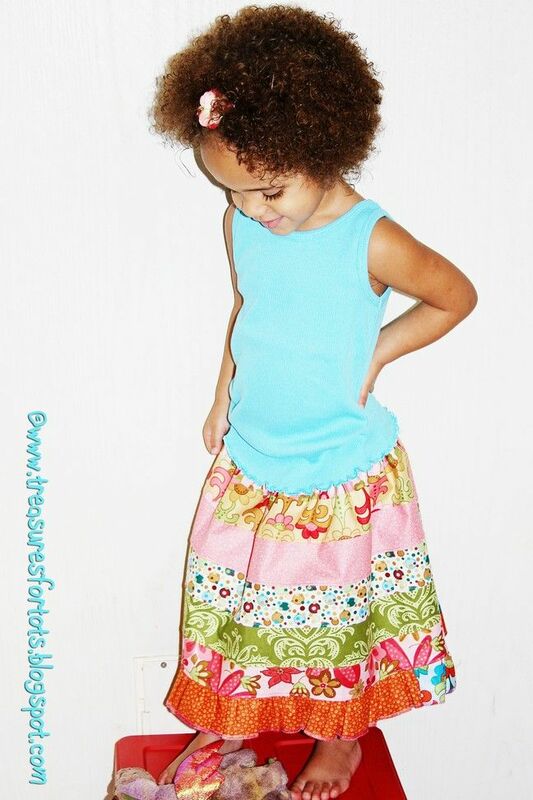 It got me to thinking that I bet ours isn't the only one doing that - and how cute would it be to sew a skirt (or several) using one jelly roll? What about a skirt that you don't have to cut out the material - at all? Even better, NO measuring or making a ton of cuts?! How about the only real measurement you have to take is your child's waist size? And the only cutting might be a bit of trimming? I got obsessed with the idea the more and more I thought about it! 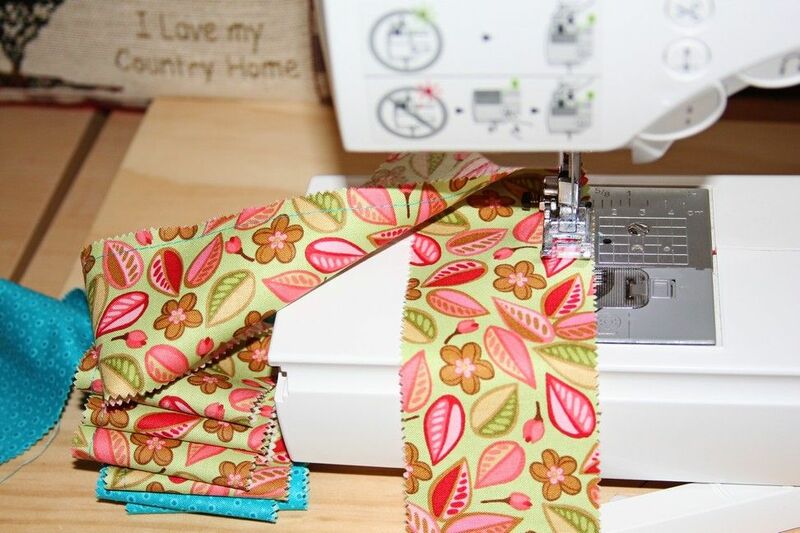 I wished I went ahead and bought a jelly roll at Wal-Mart - then I remembered the pretty Woodland Bloom jelly roll I've had for months but never did anything with it (I was going to make a purse). So I got busy and made a test skirt (the one above) for Serenity and everything ended up coming together just like I imagined. Excellent!! AND it's a skirt that is totally different - I've never seen one done quite this way. The possibilities with this type of skirt are only limited to your imagination too. Remember to click on a picture if you need to ZOOM in. And read all the instructions through carefully before beginning. I've serged all my seams - but you don't need a serger. 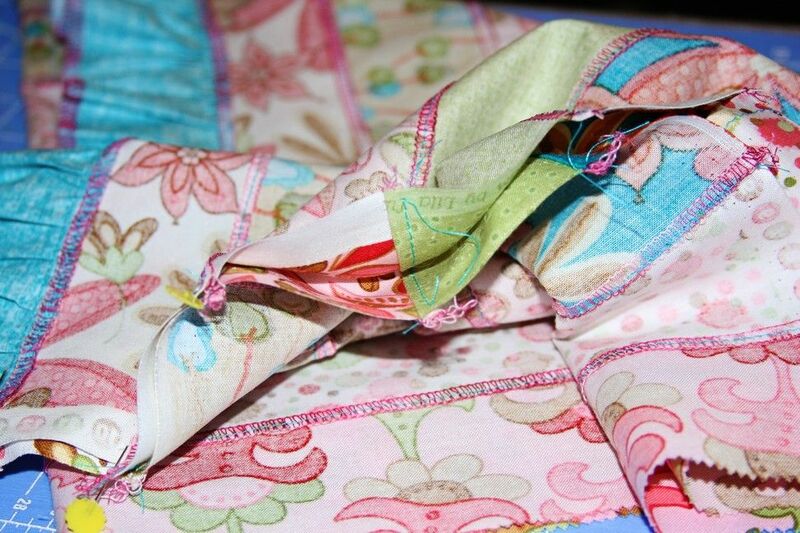 The material of a jelly roll is pinked - and pinking helps to keep the material from unraveling. 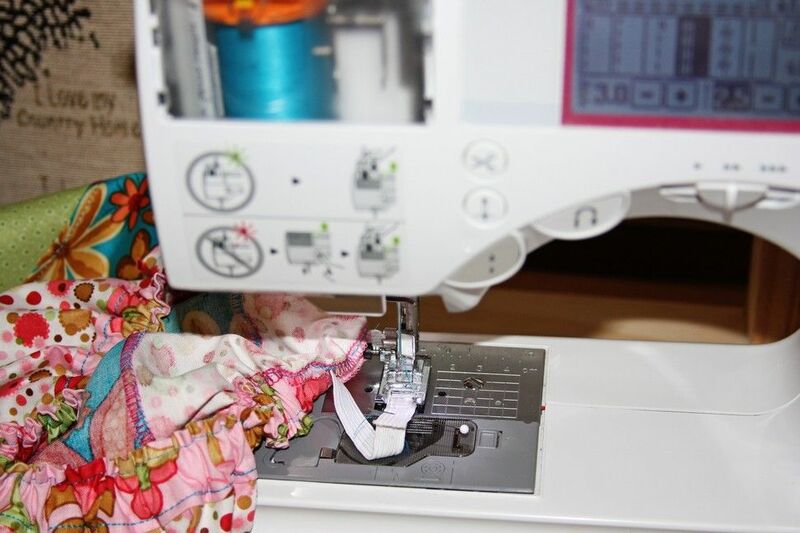 Everybody who sews should have a pair a pinking shears - they are a very helpful tool! 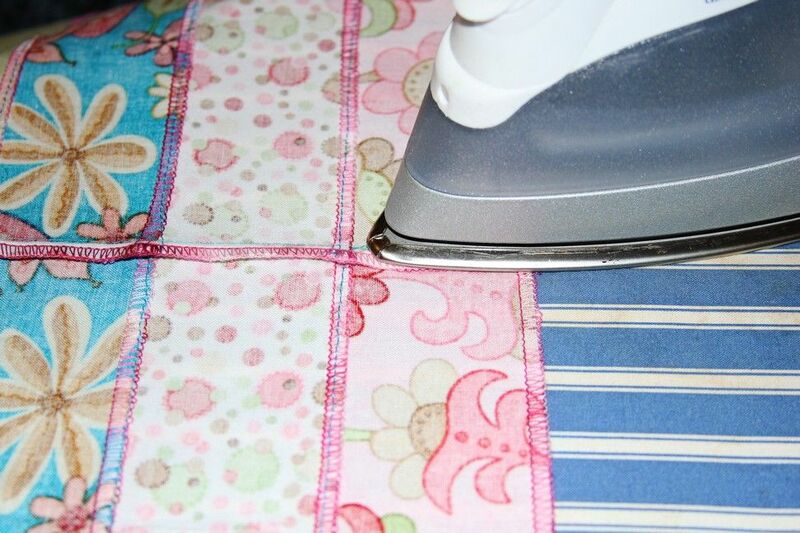 You could also zig-zag the edges of your seams. Keep this in mind when you see that I've serged my seams in the photos - you have other options if you don't have a serger. 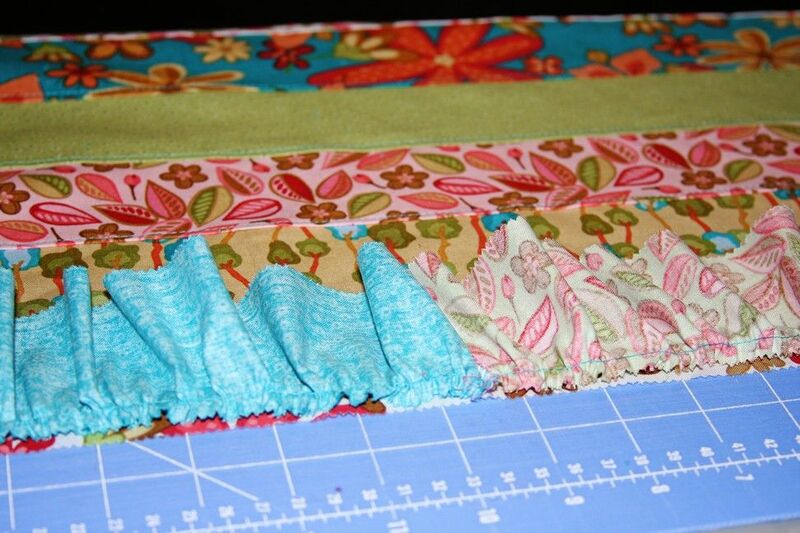 Open the jelly roll and arrange the strips in a horizontal pattern you like the best. 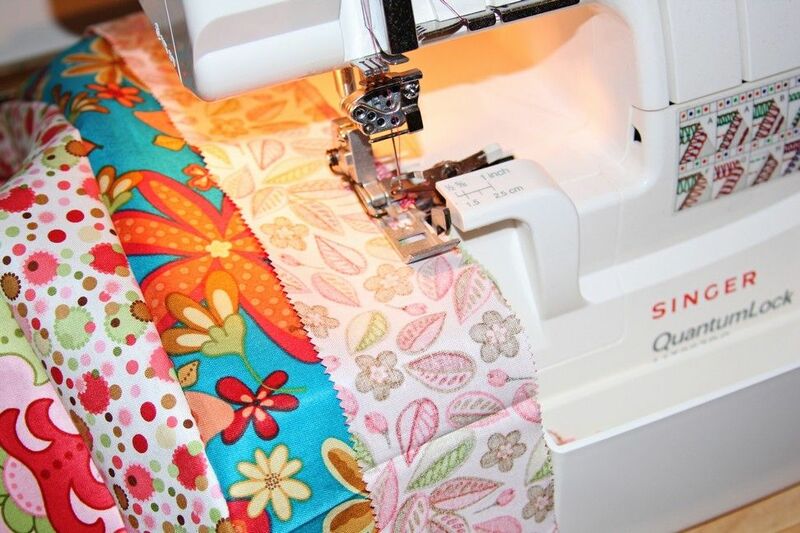 There are so many fun possible fabric combinations too! The amount of strips you use depends on how long you'd like your finished skirt to be. Once you have it the length you'd like - add one more strip (it's for the "waistband" and seam allowances). Set two more strips aside for your ruffle. Keep all these extra strips in mind when you're determining the length. Place two strips right sides facing (no need to pin, just hold them in place), and sew 1/4" from the edge (I serged my pieces together). 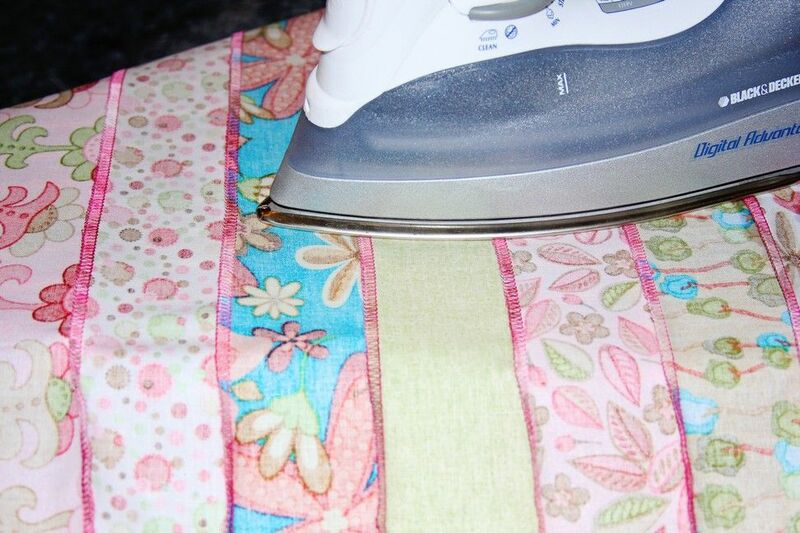 Keep doing this until you've sewed all your strips together. Serge or zig-zag the seams. Or you can leave the pinked edges alone. Some strips are a little longer than others. No problem! 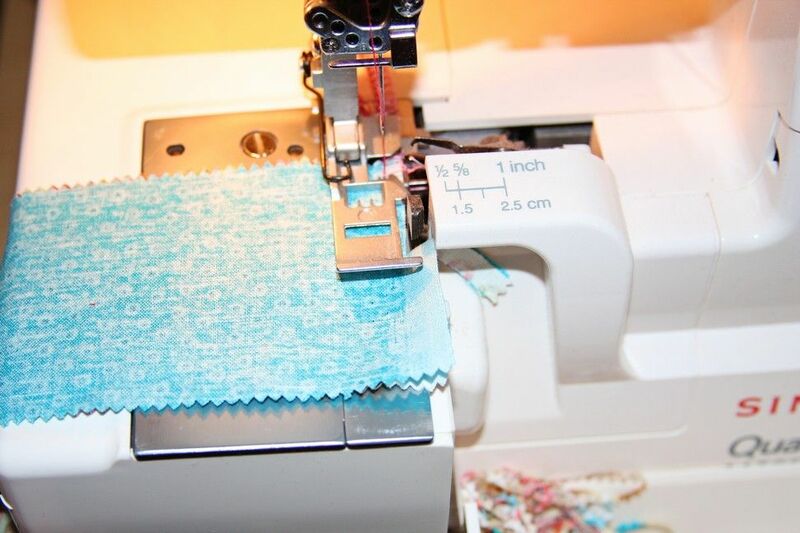 After you've finished sewing all the strips together, trim the ends to make them even. If you don't have a serger or don't want to zig-zag your seams, then this will be the only cutting you'll do on the skirt. I'll explain more further down. Iron all the seams up towards the top of the skirt. 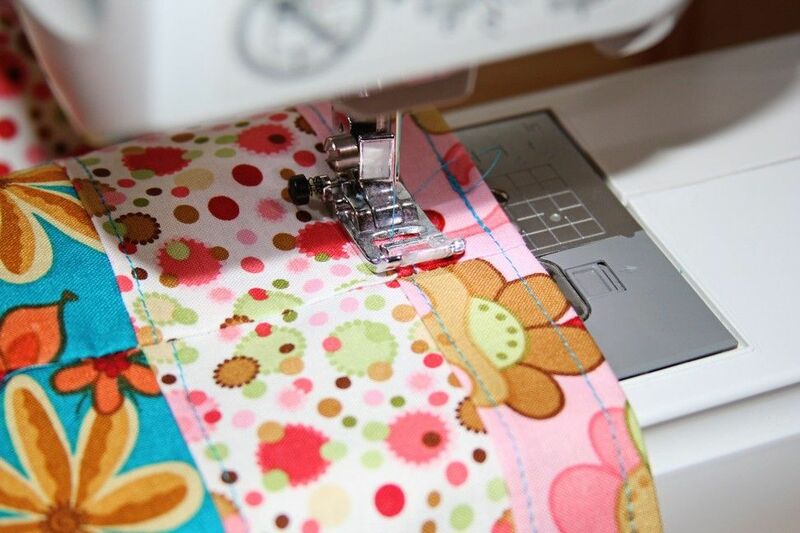 Top stitch to hold your seams down. You don't have to do this, but I think it gives the skirt a more finished, nicer look and the skirt keeps its shape better too. If you're a beginner sewer, think of it as good practice! Now set the panel aside, and grab the two ruffle pieces. 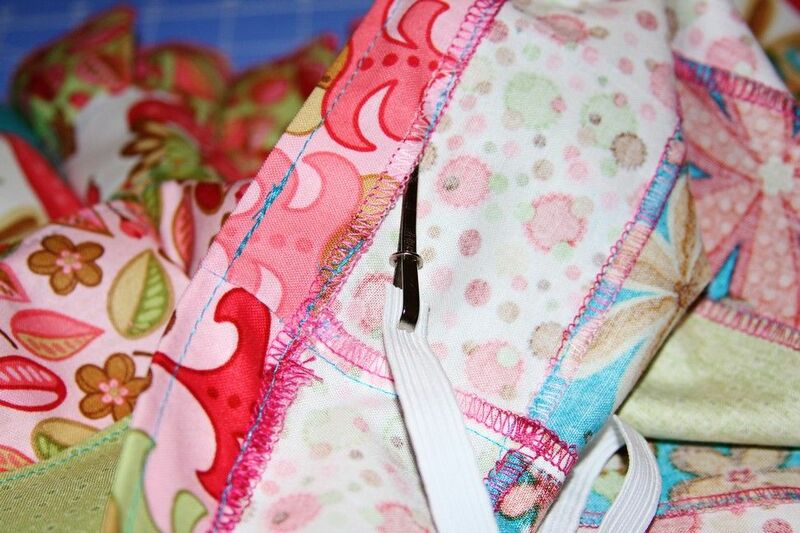 With right sides facing, sew 1/4" seam allowance (or use a serger) along the 2 1/2" length of the strips. Now you have one wide strip of material. Serge or zig-zag the seams. Or you can leave the pinked edges alone (you're gonna hear this alot). 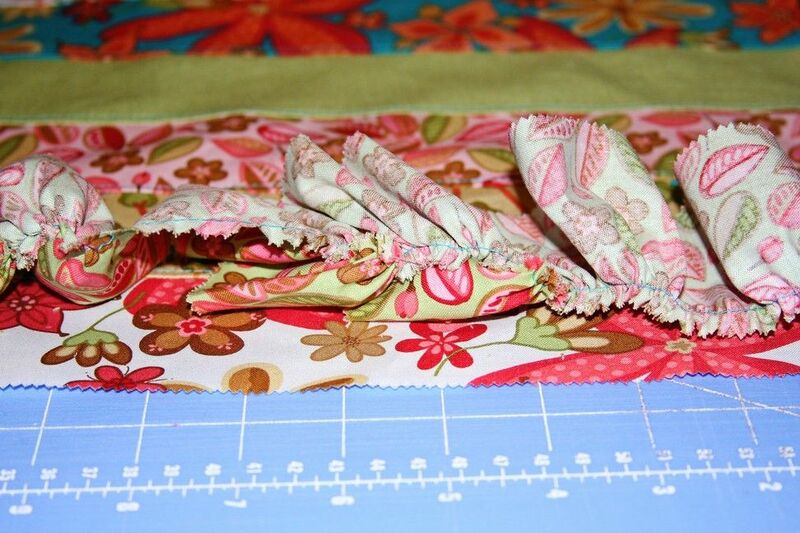 On the bottom of the ruffle piece, serge or iron a 1/4" hem and top stitch. I serged the bottom of my ruffle but I actually forgot this step and had to do it later - it wasn't as easy. Now sew a gathering stitch along the top of the ruffle piece. Pull the bobbin thread on both sides of the ruffle piece until it's the same width as the skirt panel. With right sides facing, match up one end of the ruffle piece to the end of the skirt panel. Wrap the gathering thread around the needle. Push the needle down to hold the gathering thread in place. Repeat on the other side of the ruffle and skirt panel. 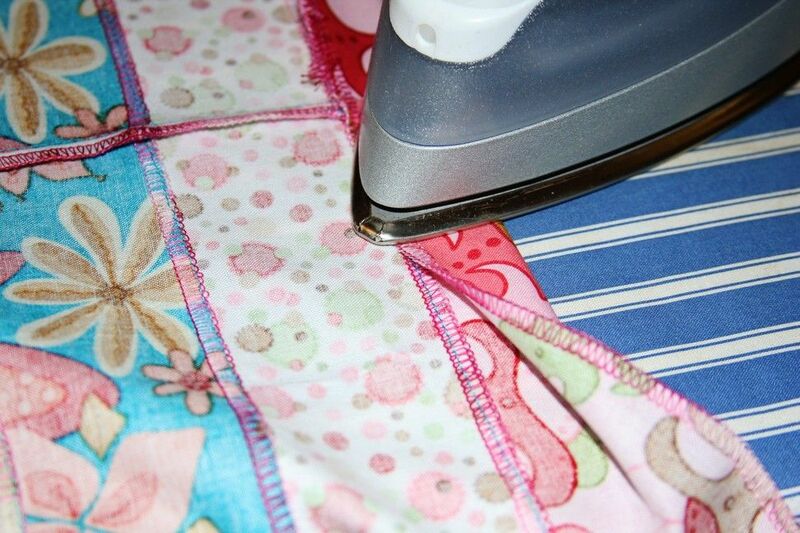 This will keep your ruffle from stretching out while you straighten and arrange them evenly across the skirt panel. See the difference in the ruffle before and after I've arranged it evenly across the skirt panel? Ruffles are time consuming, but not hard - just take your time. Besides, it's totally worth the extra effort! Pin the ruffle to the skirt panel - I use a lot of pins. 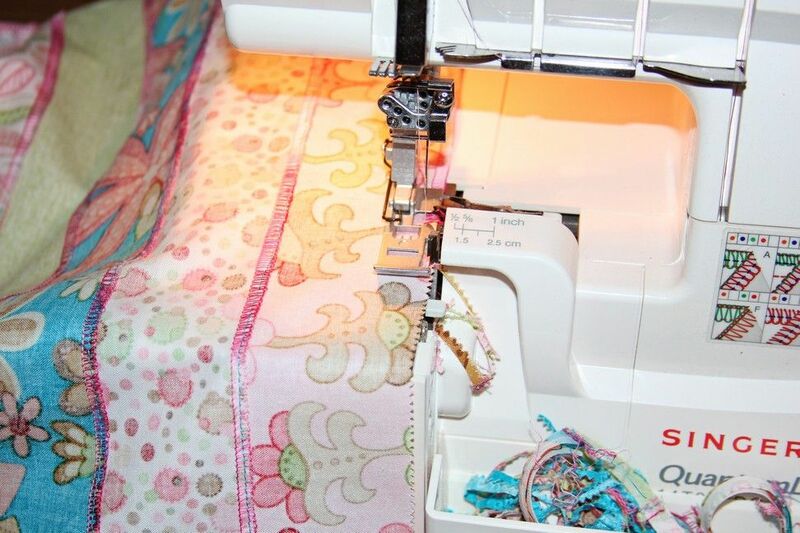 Sew a little to the side of your gathering stitch. DON'T stitch over the gathering stitch. 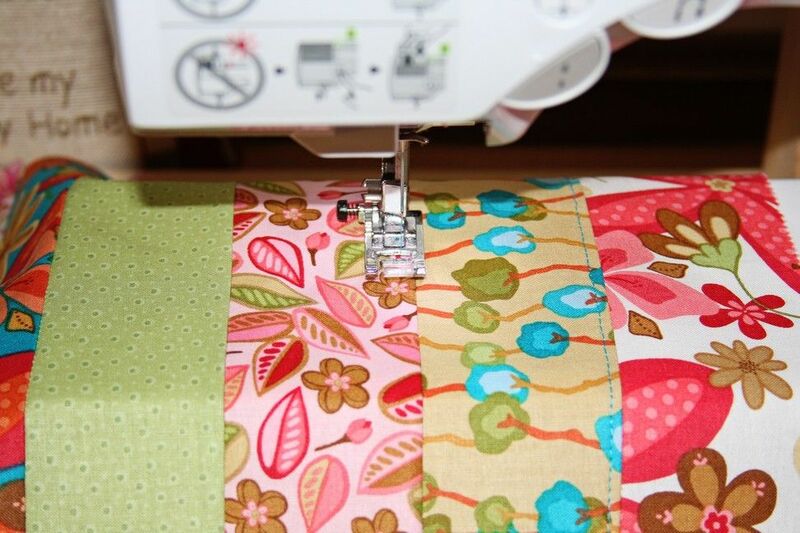 Pull out the gathering stitch - this is very easy and you don't need a seam ripper. Pull the bobbin thread and it should come right out - as long as you didn't sew over it. Remove all the gathering threads. Serge or zig-zag the seams. 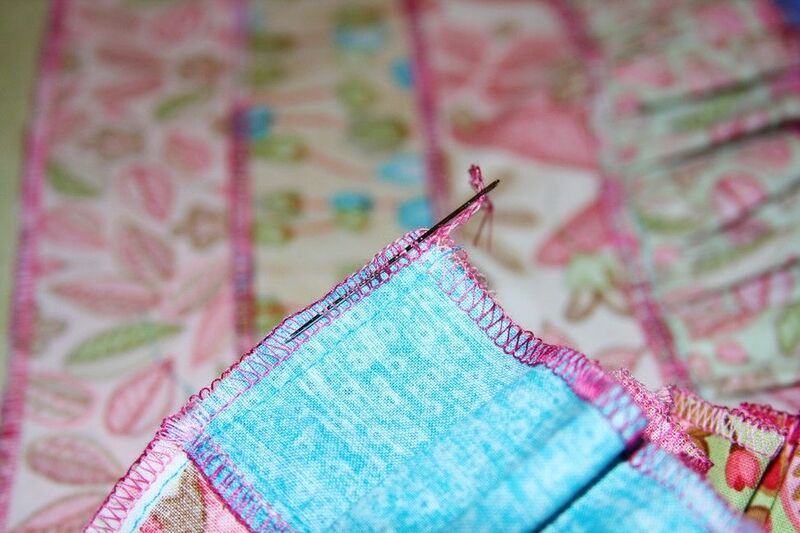 Or using your pinking shears, trim the seams - be careful not to trim too close to your stitches. Or you can just leave the seams as-is. Iron the ruffle seam up, and then top-stitch. Serge the top of the skirt - or you can just leave the pinked edges alone. I serged the top of my skirt. Fold the skirt in half, and starting at the ruffle, match up the side seams and pin. I match where I've top stitched and pin there - it holds the skirt in place better. 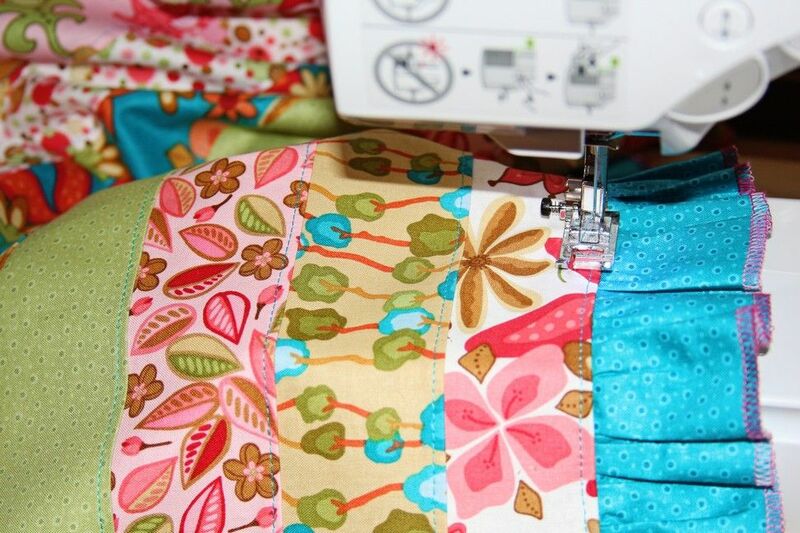 Sew down the side of the skirt. Take your time and back stitch at the beginning and end. 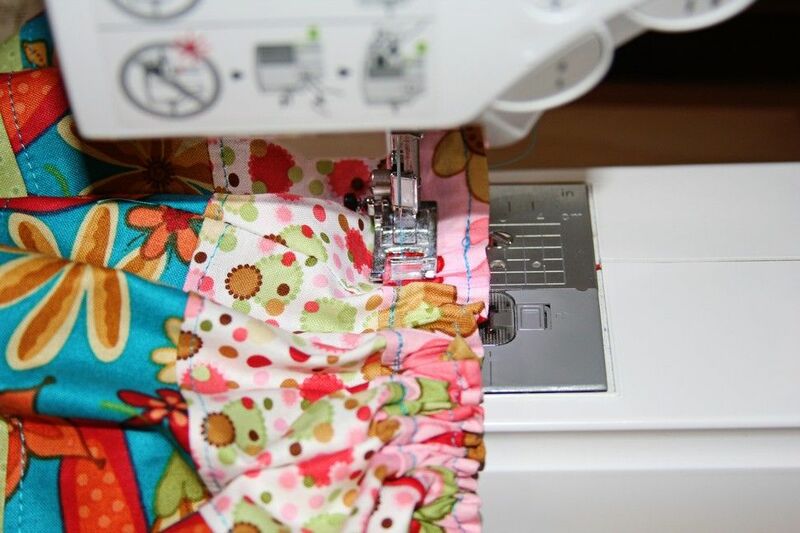 To make a skirt big enough for older children (or if you just want a fuller skirt) - make a second skirt panel, then place both panels right sides facing, carefully line up the edges, pin and then sew up both sides. Follow the rest of the instructions to finish. Serge or zig-zag the seams. 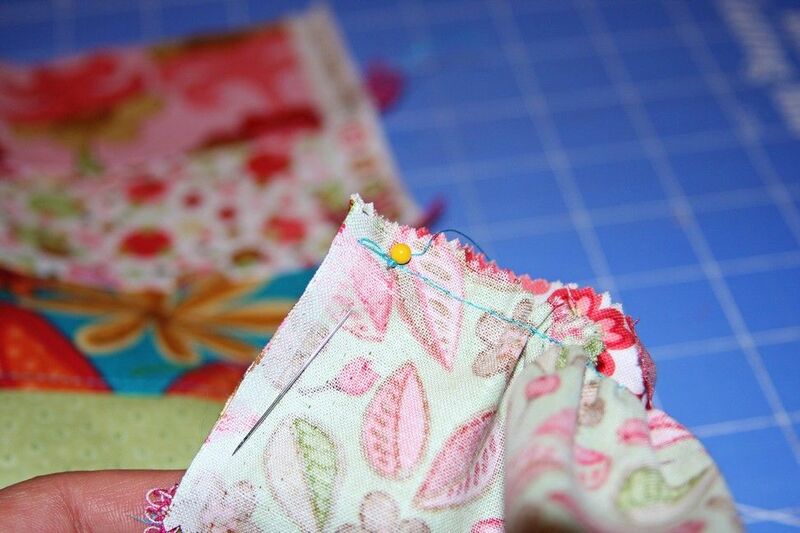 Or using your pinking shears, trim the seams - be careful not to trim to close to your stitches. Or you can just leave the pinked seams as-is. 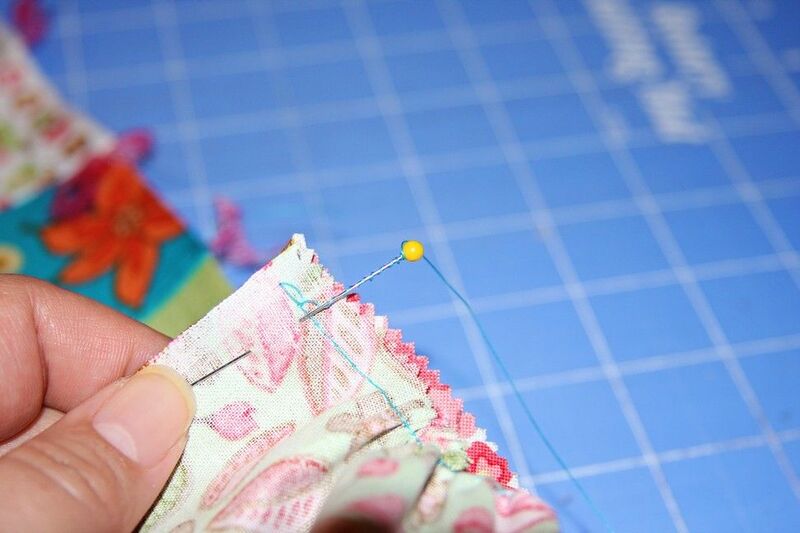 Flip the skirt inside-out and thread the loose ends on the side seam back through, and apply fray check. Iron the side seam flat. Now we are going to form the elastic casing. 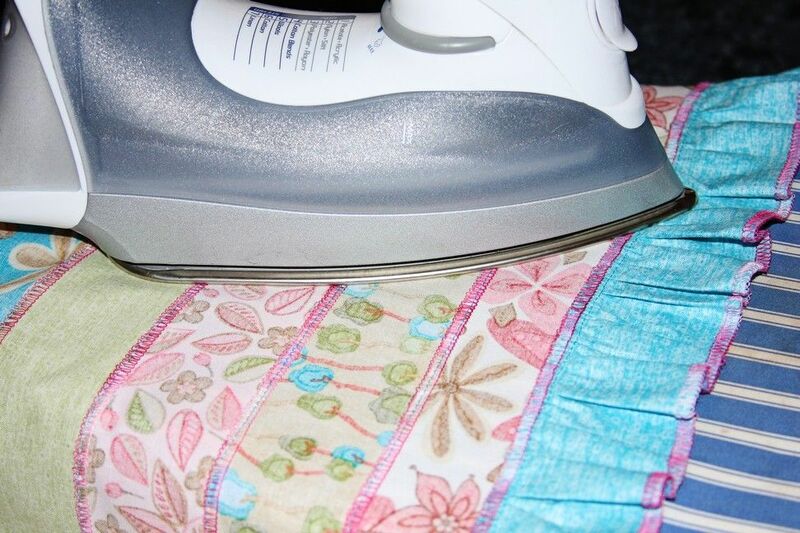 Fold the top of the skirt down even with the seam beneath it and iron flat. Continue all the way around the skirt. Flip the skirt back right side out, and top stitch 1/4" from the top edge all the way around. Make sure to back-stitch at the end. I usually try to start and stop at the back of the skirt. Now top stitch OVER the top-stitching that is already there. Stitch around the skirt leaving a 1" opening to thread the elastic through the casing. Back stitch at the beginning and end. Measure your child's waist and subtract 1 inch. Cut your elastic that length. 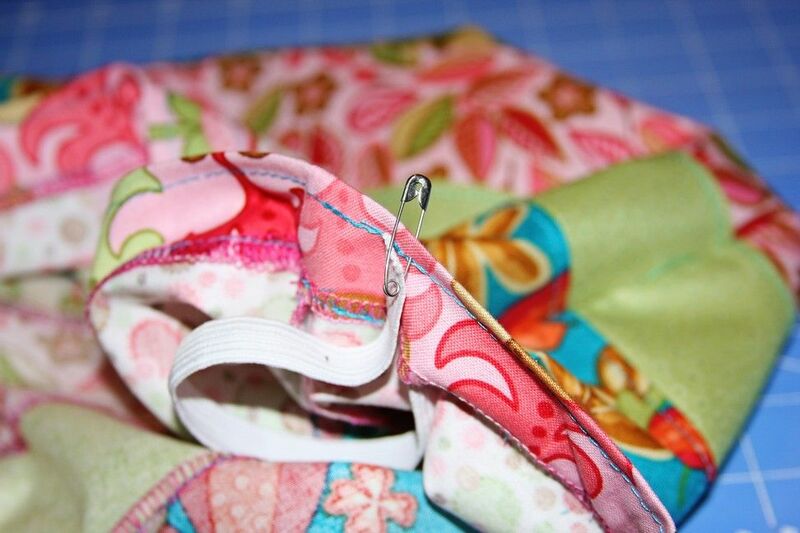 Attach a bodkin (or safety pin) to one end of the elastic. Pin the other end of the elastic to the skirt - this so it won't slip inside the casing when you pull the elastic through. Now pull the elastic though the casing, bunching up the waist as you go around. 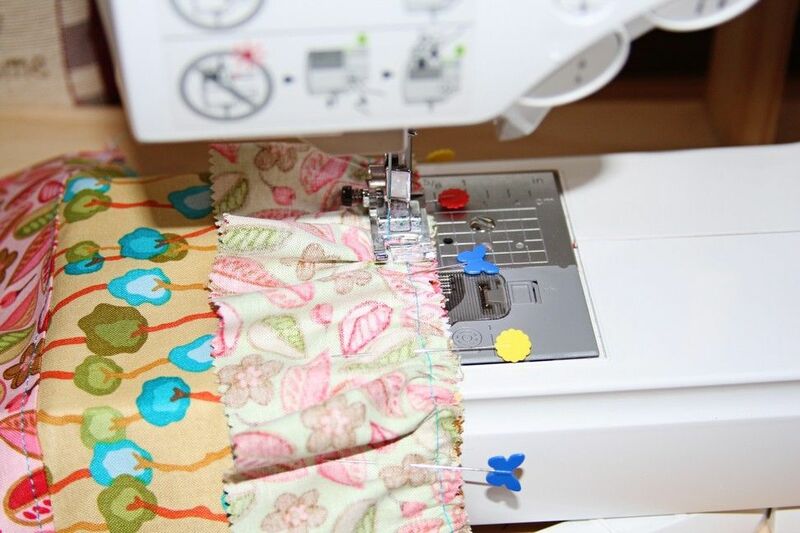 Once through, pin the ends of the elastic together and then try the skirt on your child to make sure it fits right - sometimes the elastic stretches out a bit after you've pulled it through the casing. Stitch the elastic together. I used a triple stitch. 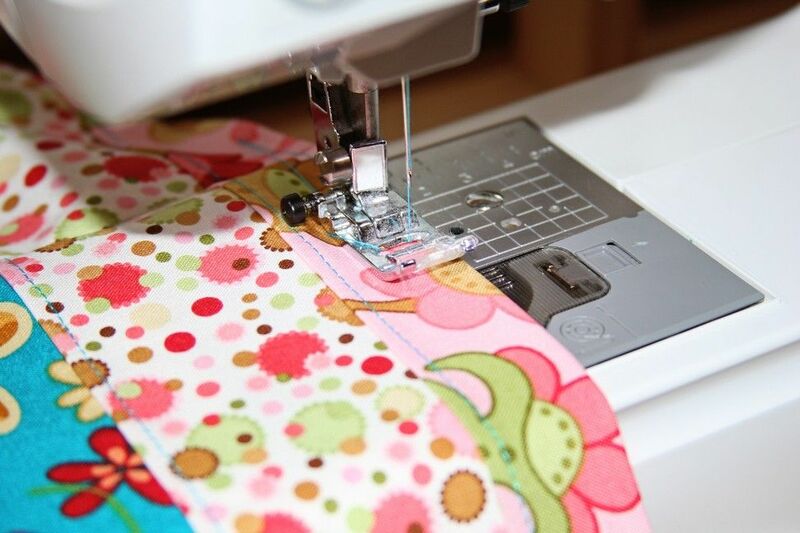 If your machine doesn't have one, just go over you stitches several times. Triple stitch the opening closed. I hope y'all like my newest tutorial!! 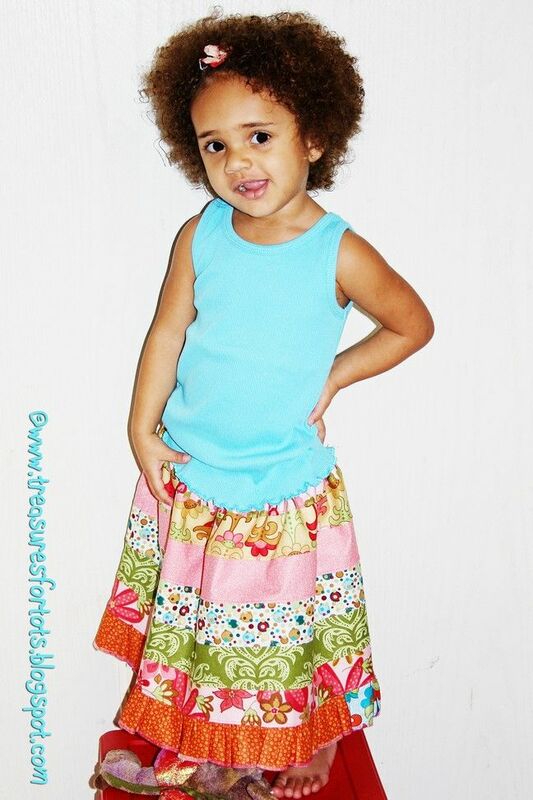 Here's some more of Serenity modeling her skirt for me! 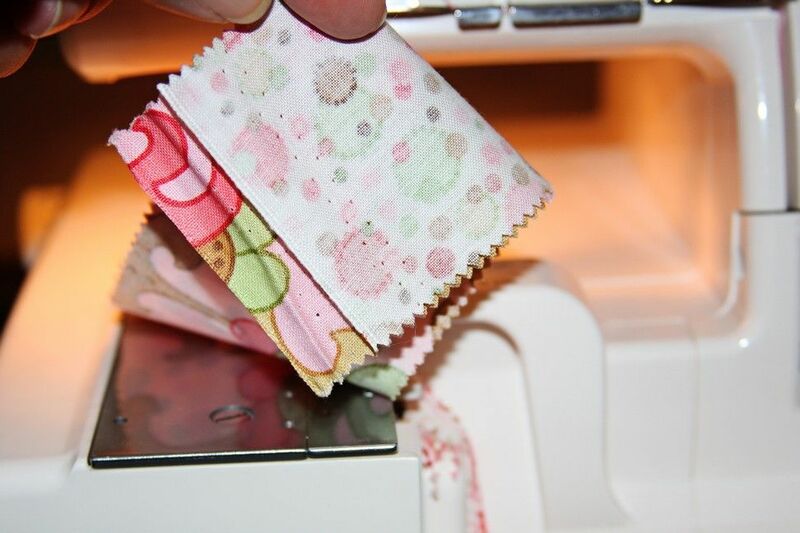 Of course you don't have to use a jelly roll - you can use any size strips that you want. With this skirt I wanted to try making a skirt with as few cuts as possible, and I wanted to make something little different than the normal stripwork dresses and skirts I've seen in boutique stores and online stores like Etsy. The inspiration and technique that went into the making of this skirt is unique. I have NOT seen a skirt made quite this way before today (1/18/10). If you do make a skirt using this tutorial, I would appreciate a link back to this tutorial please! I have no problem sharing how I did something, but I think it's only fair that I be given full credit for my ideas considering the time and effort it took to put together a picture tutorial. Besides, it's just plain dishonest to steal other's ideas and claim them as your own. You know I love this skirt!! You are so good with your tutorials!! Keep it up!! 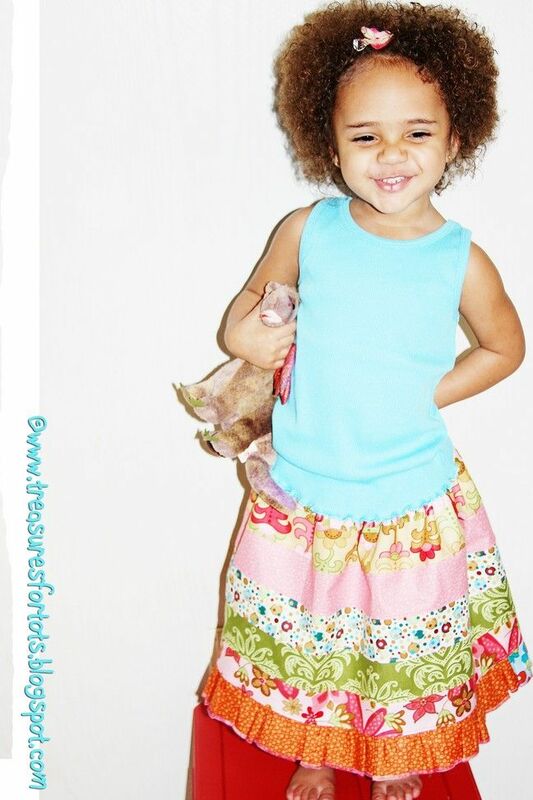 When do we get to see Serenity Sue modeling her new skirt? Wow! your Walmart sold jelly rolls?!! I live in Southwest Michigan and they are taking away our fabric department as well..such a bummer! This is so easy! I love it. 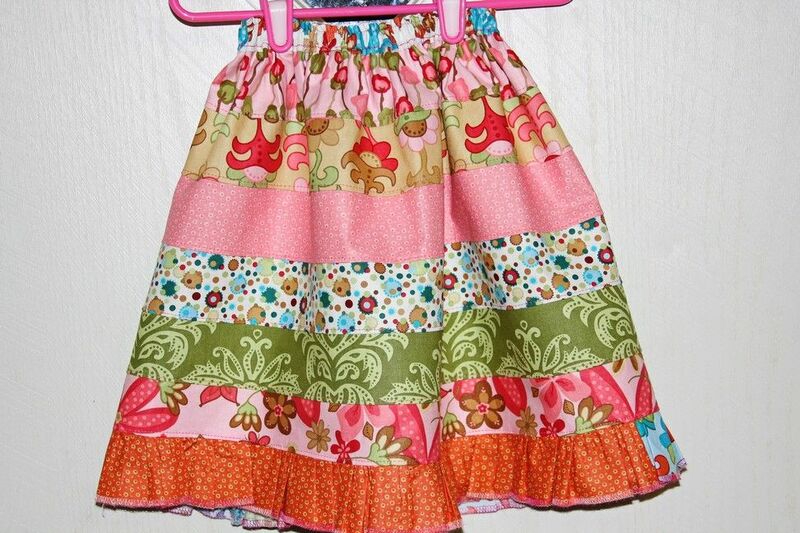 I've actually made a few skirts like this before, except without using jelly rolls (thankful for my rotary cutter...) because I can't ever find them ON SALE! Lucky you. Yay! Thank you for sharing this tutorial and the heads up about the Wal-mart closings. You're right, several are doing away with the fabrics as well as other things. We have a family member that works at our local store so we get some news every now and then! I wish my Walmart sold Jelly Rolls! That is an adorable skirt! Cute! This is something to try for sure! Thanks for the tut as well! Thanks for the tutorial. Man I wish our Walmart hadn't closed the fabric section - they never marked down our jellyrolls though. I did get a whole bolt of burlap though for really cheap so that was good. I have been wanting to do this for so long! Your tutorial is wonderful. It's the easiest one I've seen! Thanks!! 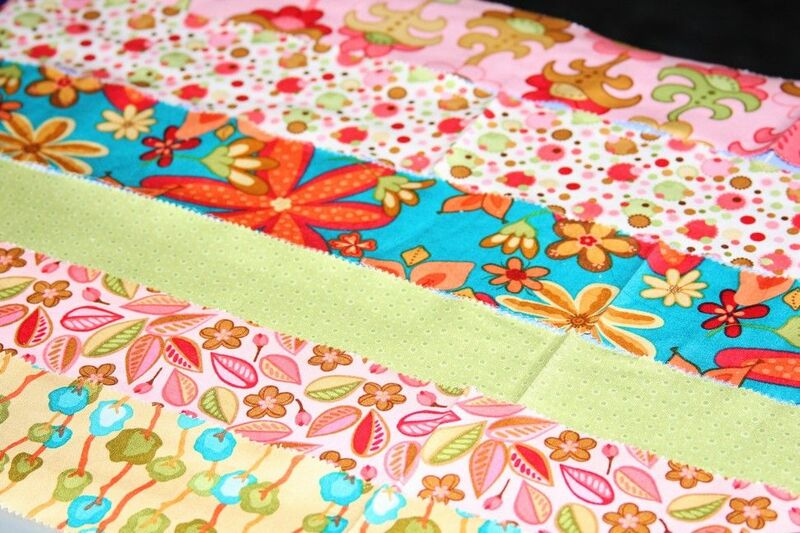 Love Love Love rhis, I love that I could also do it with left over scraps. You did a great job. Thanks for sharing. 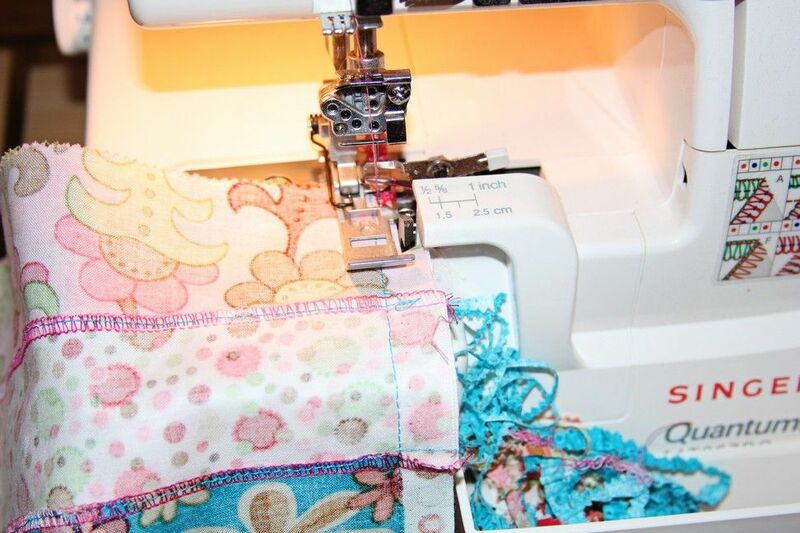 wow i just came across your blog and i am in LOVE with your tutorials... wow..wow.. wow.. i wanna try doing your felt hairclips with embroidery but i have no clue how to embroider.. so i've got a needle, felt, and my clips... now where do i go? how do i learn the stitches and how to reinforce them? Awww Serenity is so cute! Mia saw her and said, "She's my best friend", LOL! oh if you want to see some over the top fun overalls...come on by. What an awesome tutorial! Thanks so much for sharing all the details. I can hardly wait to try this for my two year old. It is perfect for spring!!! I'm so sad that Walmart isn't doing fabric anymore. 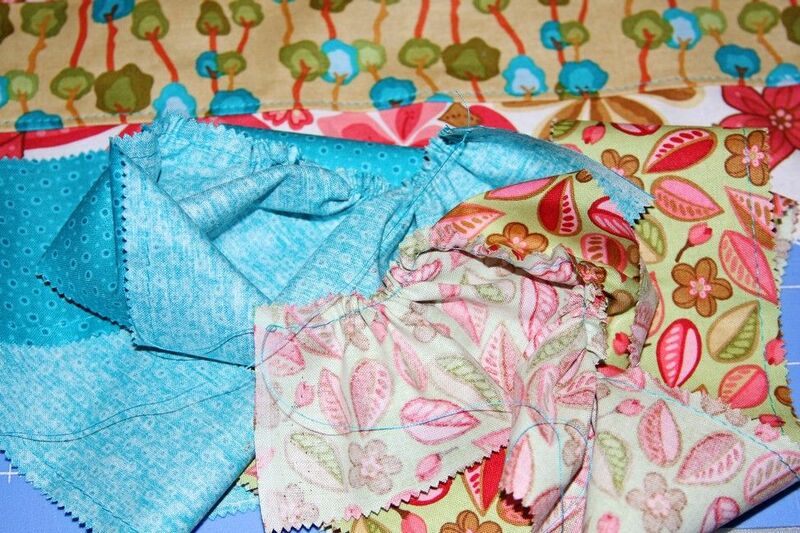 I have relied for years on their $1 table for plentiful quilt backing fabric! So cute! Thanks for sharing! And lucky find on the cheap jelly roll! So so darling! I want one for me!! Really, really cute!!!!! You have such amazing ideas! The skirts turned out super cute! This skirt turned out so CUTE!!! love it! Ridiculously cute! Stopped by from UCreate, and I'm a fellow SITS girl! I'll be linking this over the weekend! Absolutely adorable!! What a great idea. I will certainly be taking a closer look at the jelly rolls for my two daughters next time I am out! Thanks for sharing! boy am I out of the loop! 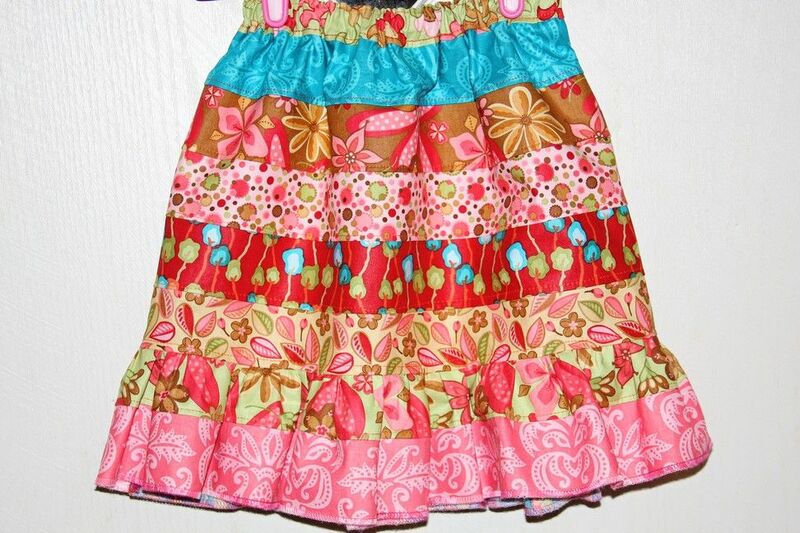 I haven't sewn for so long, I don't even know what a jelly roll is, but it sure makes a great skirt! I adore this! I'll be featuring it on Sumo's Sweet Stuff! awesome tutorial. I linked it on my blog. Thanks for sharing! Turned out so pretty. So cute! I love the combos you used. 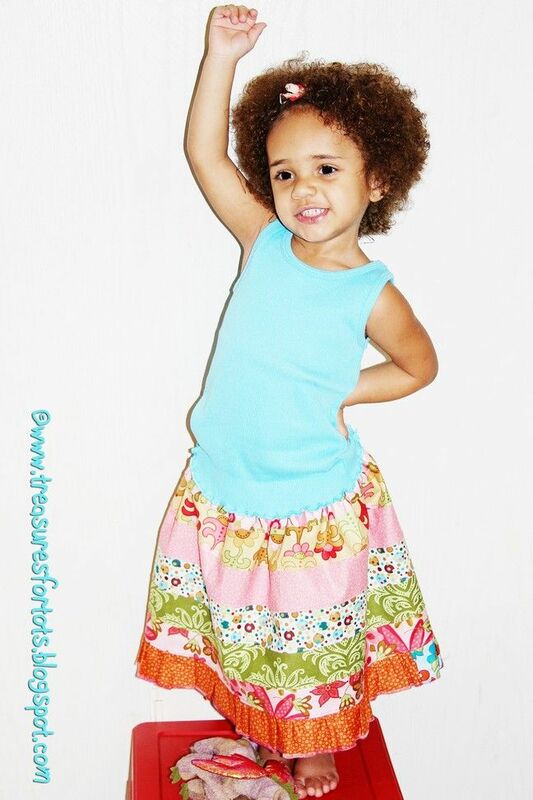 LOVE your jelly roll skirt! So many I've seen the strips are vertical, but I really like the horizontal a lot better!! Adorable! I had a quick question about your tutorial. (Thank You for the tutorial!!!) Did you use the whole strip (~44in) or was it cut down? 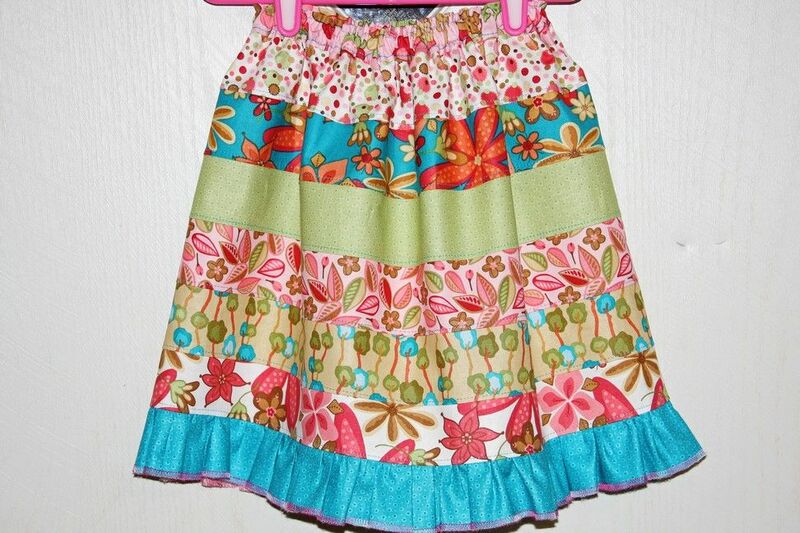 I'm pretty new to the sewing world, but I though "Gosh, 44" around for a toddler skirt? Seems like a lot?" (My girl is a small 2.5 year old... I haven't tried it out yet - but I wanted to ask you if the strips you stared with were 44" right from the roll? I can't wait to make one of these! Thank you again for the lovely tutorial! Absolutely adorable! Thanks for posting.